Cube the chicken and set aside in a bowl. Stir together the yogurt, spices and lemon juice and pour over the chicken. Stir to coat and marinate overnight. Melt the butter in a large skillet and saute onion until transluscent. Add the chicken (lots of the yogurt will come along and that's okay) and saute over medium-high heat until lightly browned on both sides. With a slotted spoon, remove the chicken to a 9x13 baking dish and sprinkle with half the sea salt. Reserve the marinade seperately. Bake at 350F approximately 30 minutes until cooked through. Garnish with chopped parsley or chives. 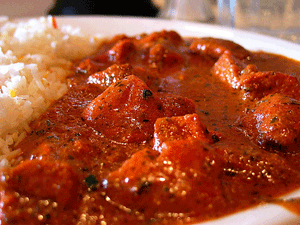 What is tikka masala spice ?Where can I get it ?